Aikido is a martial art that is much more than a physical contest between two opponents. It is far more than simply a means of imposing one’s will or inflicting damage upon another. Aikido is an avenue through which we can achieve spiritual serenity, mental tranquility and the deepest self-confidence through personal development, training the body, mind and spirit. What is offered by the Dojo (school) is not a “package course,” but a general program for lifelong progress. Factors such as age, physical condition, natural ability to learn the Aikido movements, an open attitude, and diligence in practice, all affect one’s progress. The position of teacher (Sensei), is one of honor. Your Sensei is not just teaching techniques, but is handing down the teachings of the Founder. He should be treated with the proper respect at all times. In every class there are people of different sexes, ages, and physical abilities. Senior students (both in rank and in age) should be dealt with respectfully and modestly. Never put yourself above a senior student. Morihei UeshibaAikido is founded on a philosophy of harmony. There should never be any fighting or competition in the training area. Nor is training a time to display your strength and flaunt your ego. Train always in a spirit of cooperation and modesty. Professor Morihei Ueshiba (1883-1969) Aikido is a relatively new self-defense art, founded in Japan by Professor Morihei Ueshiba. 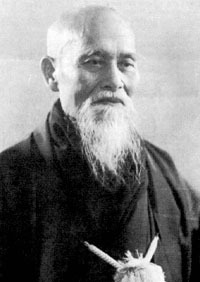 As a youth Ueshiba Sensei, or O-Sensei (Great Teacher) as he was called, applied himself to many arduous years of training in “budo,” or the Japanese martial arts. He mastered Jiu-Jitsu, the use of the spear, the staff, and enjoyed a reputation as unbeatable with the sword, O-Sensei also delved deeply into religion, studying Zen Buddhism and the Shinto religion. Although he became very strong and won many matches, he was troubled with the idea that winning at someone else’s expense was not really winning. He came to realize that true self defense is not winning over others, … but winning over the discord within yourself. Though he was an acknowledged master, he began to practice movements, exploring them deeply, searching mentally, and sitting for long hours in meditation. As a result, Aikido was born as a way to divert harm to one’s self while not inflicting permanent injury on an aggressor. As Aikido developed, it became clear that it was not only an effective means of self defense, but truly a way to understand earthly life through the study of the energy flow of the universe. The word “Aikido” in Japanese is made up of three characters, or kanji. The first and most important is “AI,” which means “to meet, to come together, to harmonize.” The second kanji is “KI,” which means “energy, spirit, mind.” In the larger context, “KI” means “the spirit of the Universe,” and not just the spirit of mere human beings. The third and last character is “DO,” which means “the way,” as in Ken-do, or Ju-do, to signify that the study of Aikido does not involve merely self-defense techniques, but includes positive character-building ideals which a person can incorporate into his life. The most unusual aspect of Aikido is that, although it is primarily a self-defense art, it takes as the basis of its philosophy the idea of being in harmony with your opponent rather than being in conflilct with him. The ideal of Aikido is not to think of defeating your enemy, but rather, to be in harmony with him, spiritually and physically. Aikido is not merely an art of self-defense, however — into its techniques are woven elements of philosophy, psychology, and dynamics. As you learn the various arts, you will at the same time train your mind, improve your health and develop self-confidence. Aikido training is excellent for the cardiovascular system. The mental training helps to reduce and control the stress of every day life. Through the physical practice of the self-defense techniques, the student of Aikido comes to appreciate and understand the mental or spiritual aspects of Aikido. During practice sessions, partners work out in harmony with each other learning when and how to yield, how to lead and guide another person’s movements to control an opponent through non-resistive techniques. The movements of Aikido emphasize a flowing flexibility and the maintaining of a stable balance. The aim of the Aikidoist is to be in complete control of his mind and body, to maintain a calm, alert posture. The continuous and flexible motion which originates in the hips and waist is a graceful spherical motion. Much of the beauty of the Aikido movements derives from the coordinated motion of the entire body, with each movement of a part of the body contributing to the integrated sequence of movements. As in other Japanese martial arts, Aikido utilizes the “kyu” and “dan” system of ranking. Generally, the Aikidoist begins with 5th “kyu” (10th kyu for children), and improves the student’s standing upward through the “kyu” ranks until she reaches 1-kyu. After passing the black belt test the student is awarded the rank of “sho-dan” (first degree black belt), and thereafter the student works up through the “dan” ranks. Periodic ranking tests are held semi-annually. Because of the nature of the Aikido philosophy, which promotes harmony and non-conflict, tournaments (“shiai”) in Aikido are non-existent, and instead well-executed performance of the arts becomes the criteria for promotion. In addition, consideration is given to the Aikidoist’s character and attitude, and his seriousness and diligence in practice. A common question is “How long will it take for me to get a black belt?” It is, of course, impossible to predict accurately when a person at the outset of his Aikido training will reach the lowest black belt level of “sho-dan”, since what is offered by the dojo (school) is not a “package course,” but a general program for lifelong progress. Factors such as age, physical condition, natural ability to learn the Aikido movements, an open attitude, and diligence in practice – all affect one’s progress. However, it is common to reach sho-dan status in from 4 to 7 years. How does Aikido compare with other martial arts? This question is best answered by understanding that Aikido is among other things, a pure art form. Like music or sculpture – each art form is beautiful in its own right, and each draws followers because of its particular beauty. The martial arts are similar; each has its own beauty and appeals to a different kind of person. It is suggested that if you are interested in studying the martial arts you first visit as many of the different arts as possible, selecting the one that best suits you.